Another ICC event. Another premature exit for South Africa. It is inexplicable how a team that is so talented fails to deliver in major events. Ever since they were recalled to world cricket, this has been a familiar depressing story. Inevitably, the word ‘Chokers’ starts doing the rounds. Is there any merit to this sobriquet? While the jury is still out on that, let us investigate whether there is any truth to this impression that the whole world and even South African fans have regarding their team. If a team doesn’t have the ability to win and loses by a comprehensive margin, then they cannot be called chokers. If a team of middling ability performs to its potential but doesn’t have the personnel and skill to win world events, then they cannot be called chokers. Neither of these are true of South Africa. Yet for some inexplicable reason they keep faltering and underperforming at world events. The term ‘choke’ contains the implication of snatching defeat from the jaws of victory due to being unable to press home the advantage. Is this the case with South Africa? The table below gives the ODI records of the top 8 Test playing teams in history. South Africa have the second-best Win-Loss ratio and are just a few decimal places below Australia. They have a great record in bilateral series but usually come a cropper in major ICC events. The table below gives the records of the same 8 teams in knockout matches in ODIs. Here, South Africa have the 3rd best Win-loss Ratio amongst all teams but are way below Australia and West Indies in the Win-Loss Ratio. This shows that the pressure of big matches does get to them on occasion. The table below gives the record of the top 8 teams in knock out matches in the World Cup, Champions Trophy and the WT20 combined. This paints a telling story. South Africa have the worst Win-Loss ratio among all the top 8 teams. Therefore, there is some merit to the accusation that they tend to choke in big events. Let us investigate whether, and how often, they have been victims of bad luck and fate in major ICC events. In 1992, they were robbed of a place in the final of the World Cup due to an absurd rain rule. In 1996, they were the team to beat in the preliminary stages but were defeated by a brilliant innings from Brian Lara in the quarter-finals. In 1999, they tied with Australia in the semi-final but were eliminated as they finished lower in the Super Six stages. In 2003, they were eliminated by the Duckworth-Lewis system after assuming that the par score was the winning score. In 2007, they batted first against Australia and posted just 149, to lose by 7 wickets. In 2011, in the quarter-final against New Zealand, they were chasing a target of just 222 and were coasting at 108/2 when they collapsed to 172 all out. In 2015, they lost to New Zealand in the semi-finals with a ball to spare. While there is no denying that they have bad luck on occasion, there is definitely some truth to the statement that they tend to lose their nerve on the big occasion. While a number of their losses can be attributed to bad luck and fate, the question could be posed as to whether they are merely good instead of great? Another question that needs to be asked is whether they have the temperament and bottle to translate their undoubted talent into performance. It is no secret that South Africa are a formidable team who have somehow failed to live up to their reputation on big occasions. 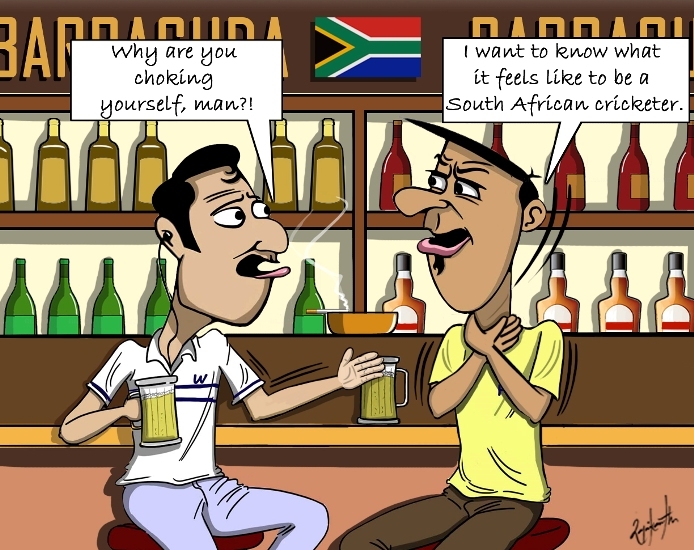 AB de Villiers has taken pains to point out that they are not chokers, as will most South African players. The word “chokers” evidently riles them. To silence their detractors, though, they need to win a world event and get the monkey off their back. They need to prove their mettle by winning on the big stage, which they can only do by seizing important moments in games. Otherwise, the world will continue to call them chokers and not without some justification.